I work closely with every client to ensure that their social media exposure is in keeping with the type of business that they run. By creating an effective, dynamic Social Media strategy, I maximise the opportunity to reach out to existing customers and potential new ones. I manage the Social Media output for businesses across many different social media platforms, utilising the ones which are best suited to the client's business and liaise with them to ensure that their customers are receiving quality updates backed up by sound knowledge of the business. 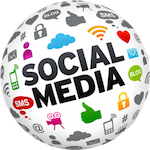 Whatever your requirements, I tailor your Social Media provision to you and your business. CONTENT IS KING - AND WHAT I SHARE FOR MY CLIENTS HAS TO BE MEANINGFUL, INFORMATIVE & ENGAGING!